Senad Gashi says Derek Chisora “doesn’t have a boxing brain” and has questioned whether the 35-year-old’s new trainer Dave Coldwell will have any impact on their clash at The O2 in London on April 20, shown live on Sky Sports in the UK and DAZN in the US. The Spain-based German heads into next week’s showdown with ‘WAR’ Chisora holding a record of 17 wins from 19 fights, with all 17 of those wins coming by way of knockout. He hopes another big KO win over the former British and Commonwealth Champion will propel his name towards Heavyweight title action. 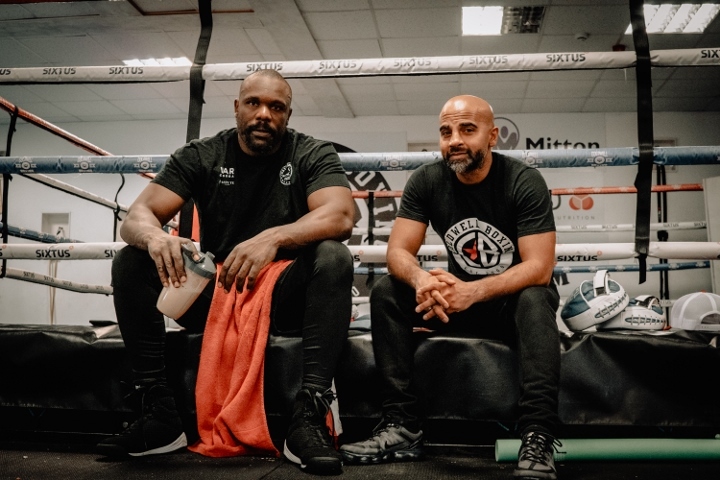 “Derek Chisora is an old dog and it’s hard to teach an old dog new tricks,” said Gashi. “Derek is a very experienced guy, he doesn’t have a boxing brain but his toughness and experience makes up for that. What I will say is he looks like he’s in the best shape of his life. Gashi travelled to the UK to take on former World title challenger Carlos Takam at short notice last time out in December on the Whyte vs. Chisora 2 undercard. After a brave showing, he was eventually stopped by the French-Cameroonian in the seventh round, but ‘GachineGun’ is adamant there would have been a different outcome if he was given time to prepare properly. “I had just three days’ notice for my fight with Takam. If I’d of had a full training camp I am confident I would have beaten him. I was fighting from instinct and my stamina wasn’t there. In the end I gassed out and you all saw what happened. I came to the fight without a coach and I decided my strategy 20 minutes before the fight started.